You’ll be sure to stand out from the crowd when you use this striking white putter from Pinemeadow to sink those tough shots. The Pinemeadow Fantom Putter uniquely makes use of color contrast to keep a player’s focus solely on getting the best alignment. Oregon-based Pinemeadow Golf has nearly 30 years of providing a full range of custom clubs to golfers around the world. Pinemeadow’s goal is to make golf affordable for everyone by offering clubs with a range of specifications and the latest technology. One of the company’s statement clubs, the Pinemeadow Fantom Putter is designed specifically to give golfers the best alignment tools. Its most noticeable feature, its pearl-like white finish, provides the most contrast against the green. That contrast makes it easy to keep your focus on the black alignment aiding lines on the putter, ensuring you’ll be lined up correctly upon address. The Pinemeadow Fantom Putter is tour-weighted at 380g, which is about 40g more than standard putters. That extra weight takes less strength to swing, which is why it’s often preferred by lady golfers and tour pros who need to keep up their endurance. Pinemeadow’s Fantom Putter shares many features with TaylorMade’s Rossa Monza Ghost Putter, which also have the white finish and black alignment lines. The Rossa Ghost Putter has received notice from Golf Digest and many other top names in golf, and it is highly rated for its bevy of features and the novelty of its white finish. Women who are not looking to make the $160 commitment for the TaylorMade club will find that Pinemeadow’s Fantom performs similarly. A comfort grip makes the Fantom easier and more comfortable to play with. Plus, the putter comes with a headcover that is vital to keeping the putter’s white finish free of nicks and scrapes. Golfers have had an overwhelmingly positive response to the novel white contrast finish of the Fantom. Reviewers found the putter to be “extremely accurate” and “easy to line up.” The Fantom is easily compared to the big names in golf, such as TaylorMade and Odyssey, although Pinemeadow clubs have a significantly lower price. It comes with a surprisingly high quality white grip, although the white color does attract dirt. 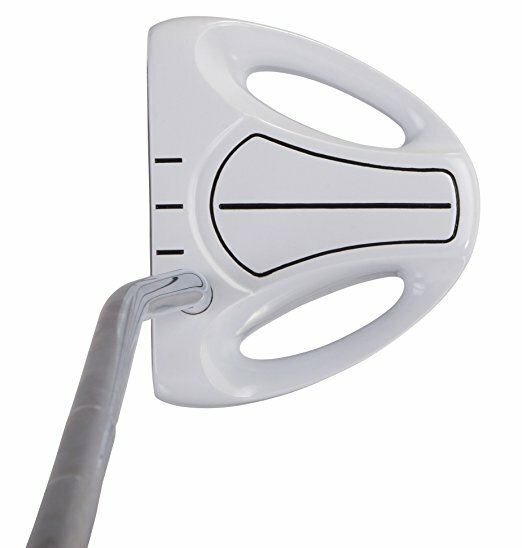 Lady golfers will likely want to take note of the putter’s heavier weight, soft face, and unique design. These features may take some getting used to, but the end result for many players was a better game. For women who struggle with their shots on the green, the Fantom may just be the change needed to improve your game.